Whether you’re running a traditional takeaway or mobile street food business there are likely a couple things that set you apart from most standard restaurants; convenience and niche. Chances are your menu is focussed around one specific type of food to varying degrees. It could be that you offer everything from burgers to chicken, or you could be a mobile truck offering one type of burrito (with veggie option) – the key thing is that you probably have a niche, a strong identity. Having a strong identity for your business allows you to use well-timed SMS messages to tap into your customers’ cravings. Whether it’s a lunchtime snack or a treat for payday if you can get your message in front of your customers just as they’re thinking about food you have a good chance of getting the order. Even if you don’t already take mobile numbers for deliveries or pre-orders just ask your customers if they’d like to receive a receive exclusive offers to their mobile – you’d be surprised how many people are willing to give up their number to their favourite brands. If you want to take it further you can then segment that data based on food preferences, location or when they place orders. This type of personalisation can be really powerful in making your customers feel special. If you’re a mobile vendor then this is the perfect way to notify customers when you’re in their area, just note where you were when you got their number. But there’s much more to SMS than promotional marketing. With a bit of creativity, you could find it streamlines your takeaway or street food business in other ways too. SMS marketing is one of the best and most versatile marketing methods you can use for your business. In the fast food and takeaway industry, using business text messaging is a great way to get right to your customers at the most important times. Hundreds of food delivery businesses are already using an SMS provider in the UK to target their key audience in a specific geographical area and, more importantly, increase sales in quiet periods. This article presents a detailed case study on how SMS marketing is used effectively by Domino's Pizza. Learn about the eight things they excel in that lead to outstanding results in building brand loyalty and generating orders. Great chance to learn from a market leader. Street food has never been more popular in the UK. An article in the Guardian hints it may be too popular already and have “run out of road.” Whether that’s true or not, it’s certainly true that there’s more competition now than there ever was. SMS could be the difference between failure and success for many of these small businesses. There are many, many different ways SMS messaging can be used for marketing and sales. But if you could only use it just a little, here are the two we recommend for restaurants and takeaways to help increase sales. 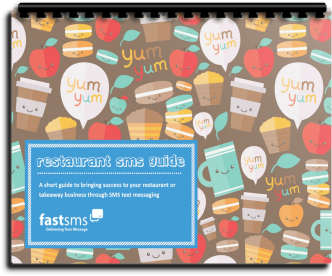 If you put these two SMS messaging ideas to work for your restaurant you just may be surprised how quickly your list grows, and how fast your sales improve. Your customers are likely thinking about food at certain times of the day, and at those times their phone is almost certainly within arms reach. Using SMS marketing you can time your messages perfectly because you know that the time you send them is the time they get read, usually within 2 minutes.